A smart motorway uses technology to manage traffic. A control centres monitors traffic flow and density, and changes signs and speed limits to keep everyone moving as smoothly and safely as possible. Speed limits change more frequently than on normal motorways: some drivers don’t realise there has been a change and that they must keep to a new limit. Speed limits on smart motorways are enforced by police: if you break the speed limit you will be prosecuted. So watch your speed: stick to the speed limits shown in a red ring and never drive in a lane closed by a red X. 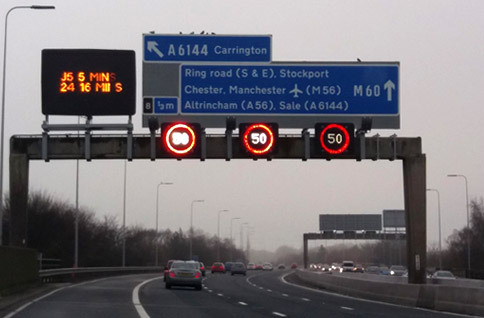 See government advice about driving on smart motorways or read more local information the smart motorways in Greater Manchester.